Literacy encompasses the ability to read and to write. These two skills are critical to the future success of all children in school. It is well documented that the most important years for the development of these skills are between birth and the age of eight. From the day children join us, no matter what age they are, we begin to share our love of literacy with them so that they can grow to be school children, teenagers and adults who are able to read and write competently and who have a love and appreciation of the joys of literature and the prowess of being able to write well. Our mentors talk to the babies and toddlers using simple language, frequent eye contact and responsiveness to their communications. They play with and talk to our children about what is going on around them. They sing and introduce finger rhymes. We share books with babies and toddlers, making reading times special experiences that children will begin to treasure. 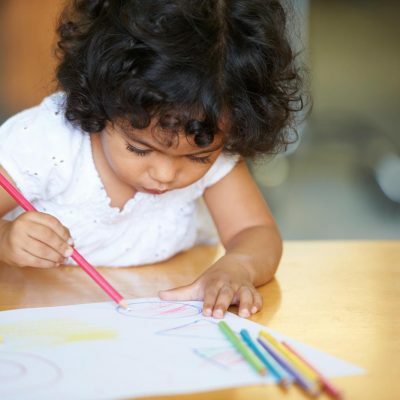 In addition we introduce children to the tools of early mark making, pens, pencils, crayons and chalks and encourage them to experiment freely. We employ a qualified Early Years teacher in each of our preschools. Their time is dedicated to teaching literacy, numeracy and early science through age appropriate interesting often cross curricular activities. One of the important factors in developing a thirst to read is being able to watch others read and write and enjoy doing so. Our staff model these behaviours, fostering an interest in and enjoyment of reading and writing. Story times for older children are as special as those for our younger children. They are interesting and fun, with opportunities to talk about the text, ask questions, and act out stories. Stories and books are often the starting point for exciting projects that spill over into art and performing art, and even outings and trips such as when our children had a real interest in the story of “The Queen’s Hat “, which led to them listening to The Pomp and Circumstance March, a trip to London to see the guards at Buckingham Palace and to visit the places the Queen’s hat flew to. The children wrote to the Queen as a group sending her a poem they had written together and were delighted to receive a Royal response. Our Wandsworth nurseries are rich in print, with words and sentences used in displays and in the environment. This provides opportunities for the children to see written words and letters around them and script used for different purposes. Our qualified Early Years teacher introduces our pre-schoolers to the alphabet and for those who are ready and interested will teach them to read letters, words and sentences. Writing and mark making areas are created in all of the learning labs so that our children can enjoy using a wide range of interesting writing tools in their play. Children are encouraged to write letters in sand, to paint and to draw as they begin to be interested in letters and sounds. This leads to our teachers encouraging children to copy words, starting with their own names. We teach children how to hold writing implements appropriately. Staff will scribe for children, writing their thoughts and descriptions both by hand and on computers and the children will often copy text that staff have written. In ensuring that our children have positive early years experiences we are supporting the development of future generations or readers, writers and learners.